Well, before you drift into a daydream about Prawn patio and Chicken farcha, let’s talk a bit about rituals in a Parsi wedding – yes that’s where you can have all these delicacies! Now that we have your attention, can we please talk about the adorable madness – that is a Parsi wedding? Like other weddings in India, Parsi weddings too have different rituals, signifying different things. There are quite a few rituals which are unique to their culture and must be seen to be understood. 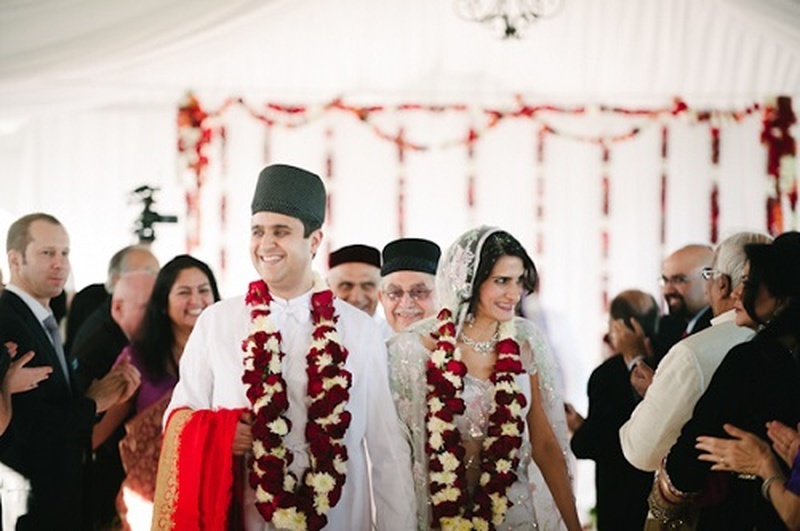 We bring to you the top 5 things in a Parsi wedding ceremony that you absolutely must not miss! This is more of a pre-wedding ritual but is an important step that leads to the main event! Once the couple informs their parents about their decision, the parents sit down to discuss the prospect. Once the wedding is finalized, Rupia Peravanu is performed to mark the official coming together of the two families. It may be considered as a modern day engagement and is carried out at the bride-to-be’s home. The groom’s side visit the home of the would-be bride and bless the bride with silver coins (hence the word Rupia) in a brocaded bag. The home is decorated with chalk designs and garlands (made of flowers or knitted with wool) and it is generally the women who engage in this ceremony. This is performed almost before every ritual and is believed to ward off evil eye. They also perform nahan to cleanse the person physically and spiritually. Achu Michu is once again performed when the bride and groom reach the venue. Their mothers perform this ritual by applying a vermillion tila (or tilak as more popularly known) on the foreheads and pressing uncooked rice over it. They may also put on the garlands and give the bride and groom a bouquet and a coconut wrapped in string. Parsi weddings are also carried out in all-white wedding attires. The bride is usually dressed in a white blouse and sari which is often heavily embroidered. Different necklines and heirloom or statement jewellery lend a sophisticated touch to the bridal attire. The Parsi groom is dressed in a white robe called a dugli and it is paired with white trousers. It is also essential that the head be covered during the ceremony. While the bride covers her head with a part of the sari, the groom wears a ceremonial hat or a prayer cap. Dressed in immaculate white, the couple is a sight to behold! Before starting the marriage ceremony, the couple lights a devo or oil lamp together to signify their union. During the actual wedding ceremony, a white cloth is held between the bride and groom and they are not allowed to see each other. Once the priest has heard their both their consents for the union, he officiates and finalizes it. The people gathered around are also asked for their consent and the marriage is finalized soon after. Well, there you go! You can finally feast on those gorgeous dishes you have been eyeing throughout the ceremony. The Parsi’s know how to party and can surely give you a run for your money when it comes to celebration and food. Dance, music and food are the main ingredients for the wedding reception. Remember Farah Khan and Boman Irani in Shirin Frahad ki Toh Nikal Padi? The Parsi wedding food feast usually comprises of saariyas (fried sago chips), raspberry drink, Chicken Sali, patri-ni-machchi (fish steamed in banana leaf), mutton pulao dal, kulfi, custard and other delicacies.